The 2016 farm cash receipts for the district totalled $17.4 million, with $10.3 million in cattle & calves. 2016 yields averaged 2.7 tons/acre of hay and 33.1 bushels/acre of canola. Based on the 2016 Census, the majority of the 201 farms were in cattle & calf production with over 10,000 hectares in hay. The beef industry on the island also helps support the Manitoulin Island Community Abattoir, a local cooperative processing plant. Aquaculture plays a significant role in the District’s agricultural industry, with 8 aquaculture operations within Manitoulin & Parry Sound, and has significant potential for expansion. Manitoulin lies within plant hardiness zone 5a. From May-October 2015/2016, the District experienced an average of 364 mm of precipitation, 1,625 growing degree days and 2,651 crop heat units. 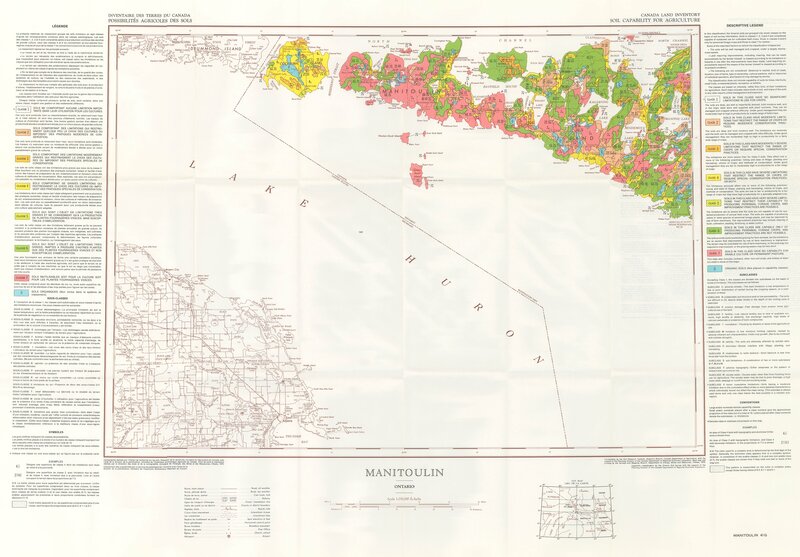 Manitoulin sits mainly in climate zone E, with the western tip occupying zone F and its eastern end in zone D. Soils in the district are derived from calatic or dolomite limestone and are generally pH neutral. Over 70% of the island is covered with soils thinner than one foot above bedrock or with no soil cover at all.